Australian artist Veronica Calarco is talking about her work. Veronica is currently doing a PhD in printmaking at Aberystwyth University, Wales (supervised by Paul Croft) and is a co-director of the Aberystwyth Printcenter. Veronica has worked in various printcentres (including Megalo access arts in Australia) and completed residencies at The Park (print centre), Adelaide, Australia and at the Regional Print Centre, Wrexham, Wales. She works in a variety of media, mainly printmaking (intaglio, screen, litho) and painting. East London Printmakers proudly invite you to join us to celebrate our epic move to Acme Studios in Mile End. More information here. 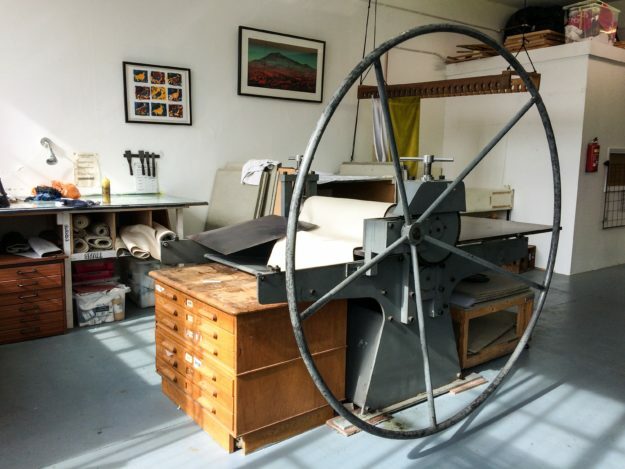 We have transformed the fabulous space at Acme Studios into one of the best printmaking facilities anywhere in London. Our new studio features two spacious rooms, one for screen printing and one for intaglio/relief printing, with natural light pouring in from the large windows overlooking the Regents Canal. A third large room on the street side of the building accommodates our office and clean area. Please come along and have a look at the fantastic facilities that ELP has to offer. You can even try your hand at printmaking yourself by printing your own tote bag, pulling your own paper screen print, or using one of our Albion presses to print a limited edition print on the day. Drinks and refreshments will be served. Our keyholders and members will be there to show you around, answer any questions that you may have and, if you are interested, talk to you about becoming a member yourself. We will also have a fantastic selection of prints available for sale. The event will mark the launch of our Kickstarter campaign. Moving tons of printing presses and other equipment, and outfitting the new space to our high standards has been a massive undertaking and very expensive. Please support out Kickstarter campaign and help us recoup some of these expenses. A number of fabulous rewards are available for supporters. Poster design by Wuon-Gean Ho.